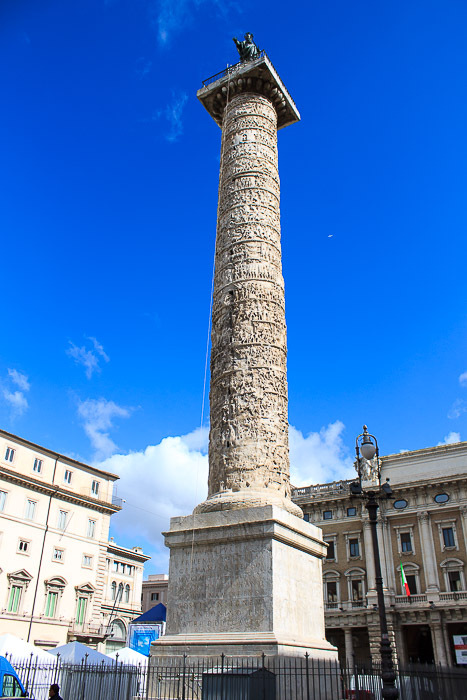 The column consists of 27 or 28 blocks of Carrara marble, each 12 feet in diameter, hollowed out with a spiral staircase of 200 steps inside which lead to the platform at the top. 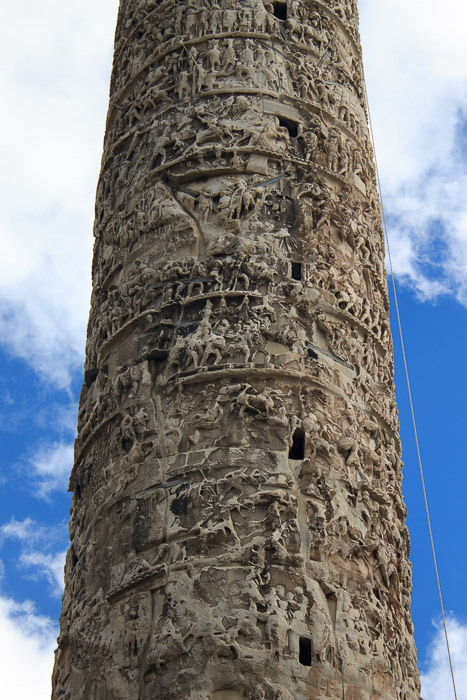 Just as with Trajan's Column, the stairway is illuminated through narrow slits in the relief. Climbing the stairs was quite popular in the Middle Ages and so profitable that the right to charge the entrance fee was annually auctioned. 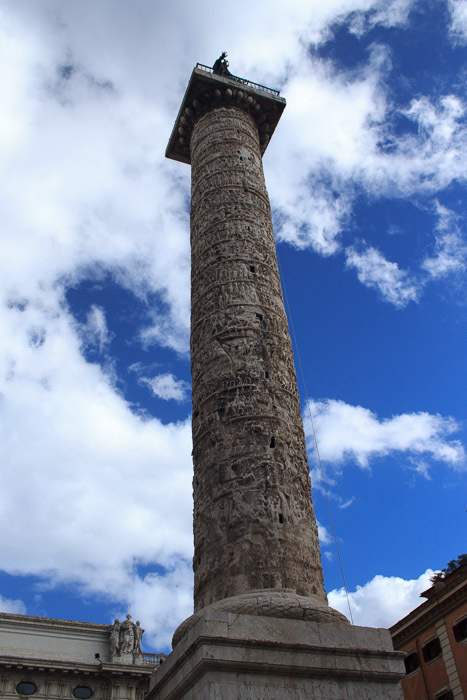 However, it is no longer possible to climb the stairs and the column can only be viewed from the outside. The spiral relief begins with the army crossing the river Danube and the lower half tells the story of the war against the Marcomanni and Quadi in 172 and 173 AD. 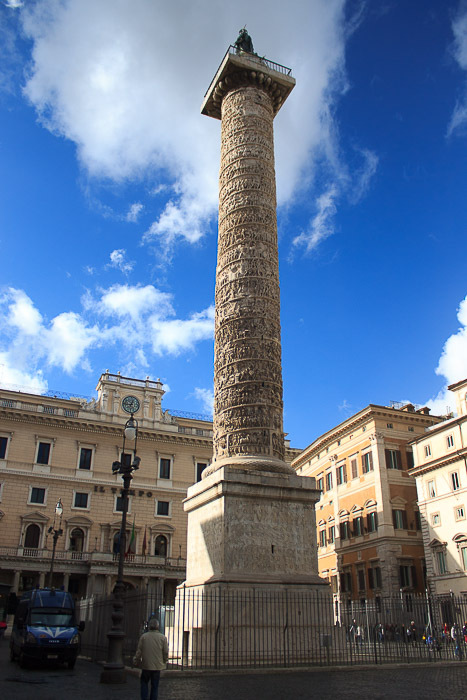 A victory then separates this from the upper half which depicts his expeditions over the Sarmatians in 174 and 175 AD. Closely related to the artwork of the 3rd century on the triumphal Arch of Septimius Severus, the figures' heads are oversized so the viewer can better interpret their facial expressions, and carved less finely than at Trajan's Column, but are carved more deeply into the stone so that they stand out better in a contrast of light and dark. The suffering and despair of the barbarians are shown well in the figures' facial expressions and gestures, while the emperor is represented as dominant, in control of his environment and with justified authority. 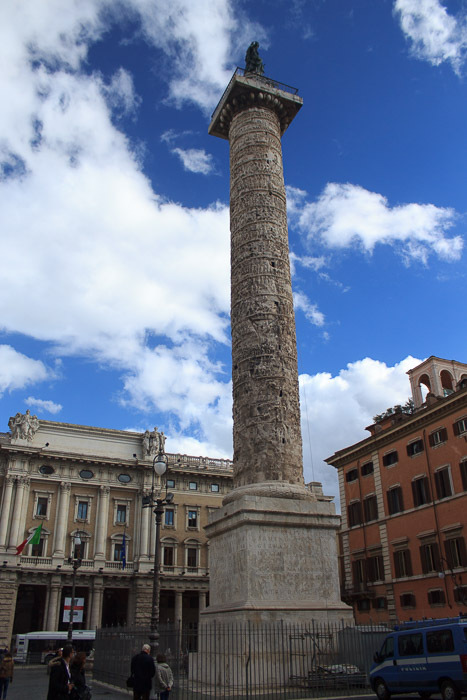 So while Trajan's Column, carved between 100 and 150 AD shows cool and sober balance, this column shows drama and empathy. By this time, war had turned into a tragic affair, full of sorrow and brutality. See all Column of Marcus Aurelius photos.